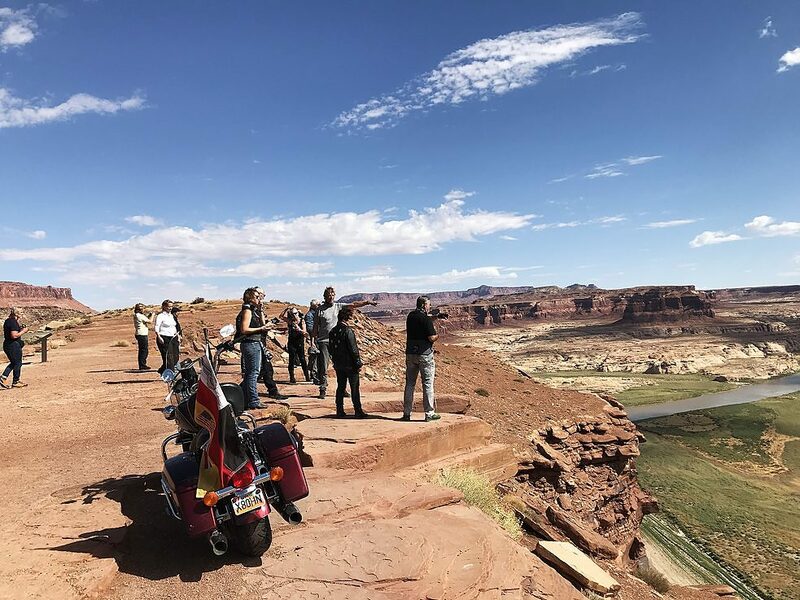 After numerous random encounters with German motorcycling groups in Utah over the years, Scott Carrier wanted to get to the bottom of why German tourists (as opposed to other tourists in Utah) want to cruise across the Colorado Plateau on Harley Davidsons. For The Big Pond, he interviews a group of German travelers in the village of Mexican Hat and, while they happily respond to his questions, he is left wanting more. In search of answers, he turns to his friend Scott Abbott who has a PhD in German literature from Princeton University. Abbott has some interesting theories involving Kant’s theory of the Sublime, Goethe, and mystical experiences as described by the German Romantics. 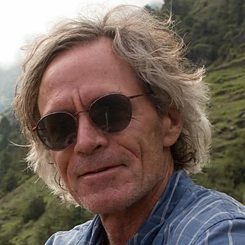 Special thanks to Günter Kykillus of Classic Highways, a tour agency specializing in Harley tours, based in Olching, near Munich, Germany. Music: “Andante Molto Mosso,” from Beethoven’s Symphony No. 6 (Pastoral Symphony), performed by the London Philharmonic Orchestra, conducted by Sir Adrian Boult. HMV recording (EMI Recording Group), re-released by Vanguard Classics. © Vanguard Records. HARLEY-DAVIDSON and HARLEY are among the trademarks of Harley-Davidson Motor Company and H-D U.S.A., LLC. Scott Carrier: In Southern Utah we have 5 national parks: Arches, Zion, Capital Reef, Bryce Canyon, and Canyonlands. They’re spread out across a geologic province called the Colorado Plateau, a massive up-thrust of red sandstone 350 miles in diameter, reaching into Colorado, New Mexico, and Arizona. Think of the Grand Canyon in Northern Arizona. It’s really big, truly awesome, but it’s just a small, tiny part of the Greater Colorado Plateau. Tourists come from all over the world to see these parks. The French and Italians rent cars and camper-vans to tour from park to park, while the Chinese seem to prefer tour buses. And the Germans – or at least a noticeable number of Germans – rent Harley-Davidson motorcycles and ride in packs. I know this because I’ve seen them. 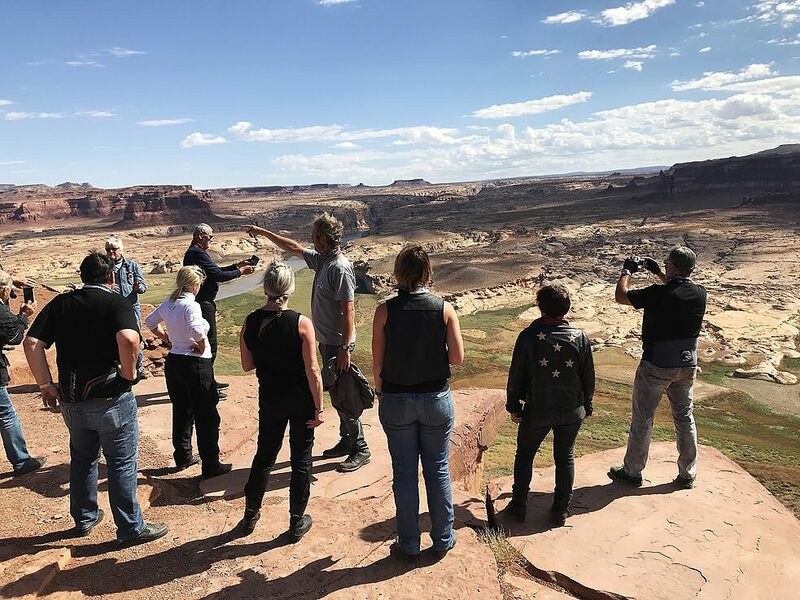 Scott Carrier: For example, perhaps the most dramatic encounter: years ago, I was driving through the very small town of Mexican Hat, Utah, in the middle of the Colorado Plateau, next to the San Juan River, overlooking Monument Valley, where John Ford made his westerns. I was driving slowly up the hill from the river and came around a bend, and suddenly there was a man standing in the middle of the road dressed in motorcycle leathers staring straight up into the sky, awestruck, as if an angel was descending from heaven. I pulled over and got out and saw there were 200 white pelicans circling directly overhead, so close you could hear the wind rushing over their wings. Huge birds, with 9-foot wingspans, all white except for black on the wingtips. They soared and they were soaring around us and up into a funnel. And it felt like being magically levitated, like hopefully what happens when you die. I walked over to the biker dude and said beautiful, idyllic, isn’t it. 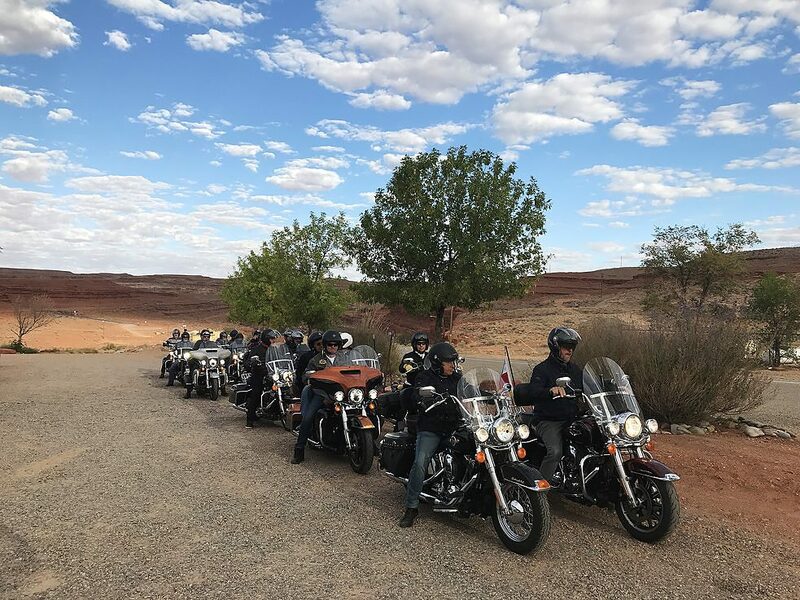 And without looking down or looking at me, he said “My friends are over there,” pointing across the road to the bar where 6 Harleys were parked outside. He was clearly having an ecstatic moment so much so I wondered if maybe he’d eaten some mushrooms or on LSD and was hallucinating, having trouble forming sentences. I thought about suggesting he move off the road, but there wasn’t any traffic to speak of, and I’m not a cop, so I just said, “Welcome to America,” and got in my car and drove away. That was years ago, but I’ve seen Germans on Harleys in southern Utah since then. I hear them in the restaurants laughing and having a good time. And it seems like they’re having a better time than the French or the Chinese. 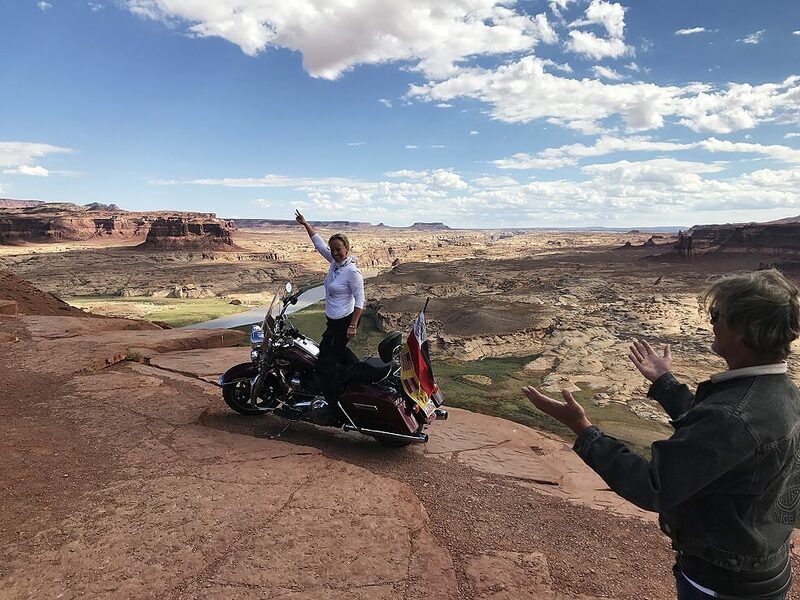 This makes me wonder, what is it about the Germans, their culture that makes them want to ride Harleys across the Colorado Plateau. So, a few weeks ago, I drove down to southern Utah from my home in Salt Lake City to get some answers. 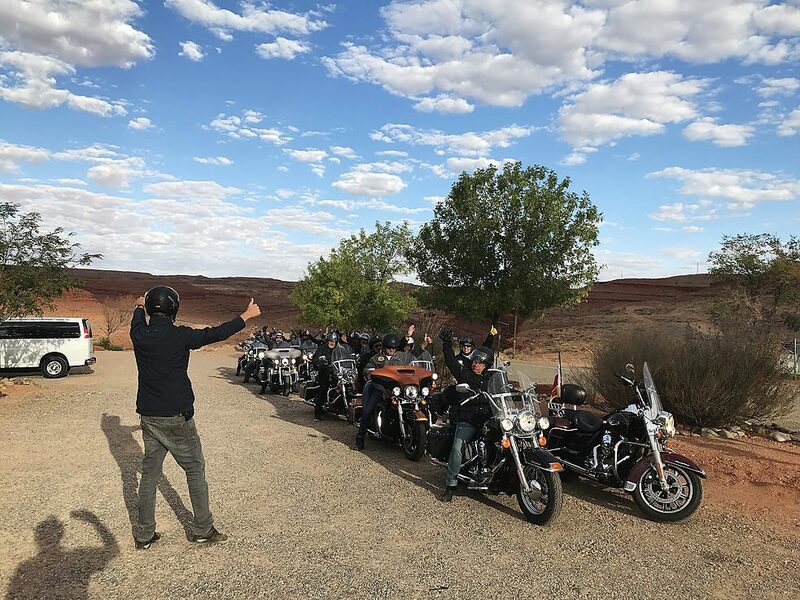 In Mexican Hat, the same place I found the dentists from Hamburg, I met up with a tour group of 20 Germans who’d rented Harleys in San Diego. They were a more conservative group, nobody wearing leathers or hallucinating. I told them, I was just wondering why they come here on Harleys. Female Voice: I love it. I’m so in love with this place. And it’s a different traveling on motorcycles than in a car. It’s a completely different experience. Male Voice: It’s so different for us, for German people, everything is so weit. Male Voice: Yes, the desert and the mountains, and the colors of the mountains, the colors of the rocks. It’s amazing. 2nd Female Voice: It’s such a freedom here that I don’t have the feeling of any fear. And I guess everything what you can see is so breathtaking that you really don’t think about what could happen. And it’s dangerous and it’s deep. This is what I felt here, being free. Being free is pretty much, which would round it up. Scott Carrier: How is it different than the freedom in Germany? 2nd Female Voice: I would say because it’s so wide. It just gives you more a wider view of everything. It’s not so closed up like in Germany. That’s always what my feeling here is, everything wide. This is, I guess what makes so beautiful. It’s huge. There are other dimensions than we are used to. And this is just what I would see here. And every day I realize…the colors…the colors are here so different and beautiful. I mean, this is something which we are not used to. Certainly not. Male Voice: (in German) Erstens weil dieses Land hier so überdimensional groß ist...ja, für mich spektakulär. Scott Carrier: Some of the riders did not speak English, so I spoke to them with the help of translation. Scott Carrier: But it seemed they were all saying pretty much the same thing. Female Voice: So his dreams were fulfilled more than he expected because he didn’t expect the wideness of the area in the US. Scott Carrier: Ah, the wideness. They come because it’s so wide. Which was somehow less than what I was hoping for. I wondered if maybe something was being lost in translation. So when I got back home, I asked my friend Scott Abbott to listen to the interviews that were in German. He has a PhD in German literature from Princeton University. Scott Abbott: Your translator kept using the word “wide” to somehow describe what they were feeling and seeing. And they kept – the people she was translating – kept saying this is inexpressible. Yeah, it’s not expressible. So they’re talking about this landscape that they’re in, and they’re talking about it in terms that felt to me like Immanuel Kant’s theory of the sublime. Scott Abott: Yeah. One man said something about a non-dimensional, over-dimensional,… überdimensional groß. Groß, Yeah, überdimensional groß. Groß means large. And then it’s large without dimensions. It can’t be measured. He’s just used words that Kant would have written. You have this feeling in nature that is overwhelming, and it’s also pleasurable. And how can it be both overwhelming and pleasurable? And so he says there’s a kind of mathematical sublime. That’s when something’s simply too big for your imagination to grasp it. Then he talks about a dynamic sublime, when you’re standing right under a huge cliff, maybe an overhanging cliff, or you’re near a volcano. That threatens to overwhelm you. It makes you feel powerless. And you know that nature is so much more powerful than you are. But you can come back around with your mind and think, but I’m a bit distant from it. Or, I can see it, and I know it’s not going to reach me. Something like that. So if Kant was right, it’s a really important experience for us to be overwhelmed by nature... We sense our inadequacy and powerlessness, and then at the same time feel that we can deal with this in one way or other. We’re part of nature. They were very clear on that. And so their most famous poet is Goethe. He was obsessed with nature. His first novel, The Sorrows of Young Werther, is about this young man who lies on the breast of the earth and feels the worms crawling under him. It’s like this mystical union that’s all through that novel. And the sun is just shining so intensely on me, and I’m one with nature. So he had this desire all his life to be one with nature. He said, the three most important influences of my life were Shakespeare, Carl von Linné – who did that scientific system, categorizing – and Spinoza. And Spinoza got kicked out of his synagogue in Amsterdam when he said things like “God, comma, or nature…” In fact somebody attacked him with a knife on the synagogue steps, when he was 21 years old, tried to kill him. And they excommunicated him when he was 22. Scott Carrier: The time was, like, late 1700s? Scott Abbott: Yeah. The philosophers – Fichte, Schelling, Hegel – they all taught at the same university. And Goethe was head of the university, in Jena. It was an amazing group of people, all gathered together. And Schelling may be the most interesting in terms of nature, and how Germans might still be seeing nature today. He wrote nature-philosophy: Nature is visible spirit and spirit is invisible nature. And the German word for spirit is also the word for mind. So he’s saying nature is visible mind, and mind is invisible spirit. And so if you see yourself as nature, then all of a sudden you’re one with the whole thing, and everything is one with you. And then it’s a mystical experience. And maybe it’s enhanced if you’re in a place like the Harley riders that you were seeing. Maybe it’s enhanced. If all of a sudden you see the incredible distance that they were seeing – they’d never seen that distance. Maybe it’s that sublime that Kant was talking about. Maybe that’s what happens right there. And Germans may be especially open to it because of that cultural background. Or maybe it’s just human…maybe we…don’t we all feel that? Scott Carrier is an American author, award-winning radio producer, and educator. His pieces have been featured on numerous radio programs, including This American Life, The Savvy Traveler, Marketplace, Day to Day, All Things Considered, and NPR's Hearing Voices.